Cassandra has been posting on FB and assures me that she is all right and no fires near her. The lead to charge her computer has broken, and she posts on here using it, so hopefully we will hear from her when she gets a new lead towards the end of the week. Gregotyn, sounds as if you need to sort out a new shed with some of the stuff falling out of the old one. Pity about the dinner; we can usually get quite good roasts in this area, but they do vary a lot. Think we may have had the tiniest hint of snow last night. It was raining yesterday evening, but was supposed to turn to snow then freeze. We have a very little on the Velux window, but none showing on the lawn, so it must have been very little, and the ground too warm for it to settle there, but has now frozen. Wasn't feeling very well yesterday, so had a quiet day doing a few odd jobs at home. Thought I was going down with the current lurge, but a bit better today, so will carry on and assume I beat it off (Hopefully). For some reason our outlets keep ordering log sacks, so lots more to make. At least the cold weather should keep the sap down, so I might get a bit longer to get my birch in as well. Bitter, bitter cold. Close to 2 inches of snow yesterday when temperatures were at freezing. Heavy, wet snow. Last night down in the teens, Fahrenheit scale. Himself got the driveway semi-plowed this morning. Semi, because there is a skim coat of snow on the asphalt. It is now 5:45 p.m., Current temperature on the roof is 9.9 degrees Fahrenheit. Steady wind over 10 mph with gusts about 20 mph. Taking wind chill into account, that's the equivalent of minus 9.9 degrees F.
Expect tonight's actual temperature will drop below 0 Fahrenheit. Wind chill even lower. a wolf as a bed warmer helps if it is really cold, a house and a burner is even better . hunker down and enjoy . The lamb's wool comforter I brought back from Holland lo these many years ago does quite nicely. But no doubt it will be a two cat night tonight, dpack. Greenhouse thermostat is set to 55 degrees F. The built-in thermometer is reading 50 degrees F. And the thermometer at the end of the greenhouse opposite the heater showed 42 degrees F. the last time I looked. At least the wind has died down. And we're not as bad off as Chicago or Kalamazoo. I have seen that done on TV, but we never get it that cold here. It is fairly cold by our standards here; below 0C overnight, and didn't get much above 4C all yesterday even though it was sunny. We had a sprinkling of snow in the woods, but at home there was only the slightest touch on the roof light, so we must have been at the absolute southern edge of the snow. Log sack orders coming in like crazy. Look after yourselves Jam Lady. That is real cold. Yes, gz, I realise the situation is bad in Australia, and that comment of mine was not meant to be flippant. I am concerned for all people wherever they are, when there are circumstances that could put them in peril, so I apologise. Yes I am going to sort a new shed asap, MR. I had just gone past through the gate to take a box of firewood, and when I came back the shed was resting on the gate. so I added another prop and climb the gate hoping it won't collapse! The timber stored in that shed was really dry and that was my next port of call for cutting kindling. I have a lot of "H" frames in heavy steel and they will make a temporary shelter. I could just do without the weather as it is-cold and frosty. I am thinking of buying a welder to join steel together to make a roof frame for the "H" frame base. Just need the time now. Sorry to hear you aren't so well MR. Do take care; in this cold weather, we are subject to trying to do too much when we should be inside in the warm. I am fairly lucky in that I don't mind the cold weather, and prefer it to the summer heat, when I am always squinting and in the shade when I can be-in reality I just suffer from old age! Lots of snow yesterday morning, but gone today. The council boys had ploughed and gritted, and passed me as I was coming out of my drive, going back to their base. This a.m. just ice, and the boys were doing their job again as I went out at around 5am. Your council men sound really good Gregotyn. Ours must have been out gritting too as although we had a reasonable covering of snow overnight, the road outside stayed pretty clear although snow everywhere else. Haven't looked out there yet this morning, but when the cars mix it up, it should clear quickly. Worked on log sacks again yesterday as all our outlets running out. Managed to do 24 and husband and son delivered a total of 50 yesterday. It was flipping freezing; I was wearing thick winter trousers, 3 layers at top and a hat, which is unusual for me, and I was still cold. It was just above freezing, but there was a cold wind blowing through the log store. I had to work without gloves as I can't handle the sacks and labels with gloves on. Didn't thaw out properly until I had dinner and a hot bath. Must make you laugh Jam Lady and Slim, as you are so much colder where you are, but probably manage cold weather better than we do as you are more used to it. I expected snow to some depth, but we had none over night and only a light ground frost, nothing on the windscreen and I sailed to work. The gritting lorries had been, but all that could have been frosted were clear by the time I went out. It appears their start time in the gritting season is 4am! Actually they are very good, our council workforce is very down to earth, but they earn a lot of money in this season. And with how they do this time of year and during the rest of the time can only be complimented. Not so the councillors. They are over paid and all they can think of is how to reduce the costs-well for a start they have huge salaries if they are in the 'inner circle' and about 1/3 of that if you are an ordinary councillor. I thought that councillors were volunteers and got expenses! My brother was a county councillor once in East Staffs and he didn't claim any expenses or get a salary. But there is to be a meeting with councillors here in the library at which they are looking to reduce or close the library to cut down costs. There is an influx of children who come in here to do homework at 3.30pm. as well as a lot of folks like me whose skill with computers is one fingered typing, and the librarians are so helpful with that and in many other ways-I pay my rates and road tax here too. Simple it may be, but I wouldn't attempt it if I was at home on my computer(if I had one!). We were much warmer today at 5am than yesterday, my foreman informing me it was -9c yesterday but "only"-4c today. You are right about the cold, MR, I am wearing 2 layers below and 5 layers on top at work, but in my defence I am sitting right by the outside roller shutter door, and I am old! It is no excuse to be aging, but I am lucky in that I don't feel the cold as much as I used to do about 20 years ago, must have got used to it-or working harder. I am finding that my hands don't get as cold if I wear wrist bands across the point where the wrist meets the hand, at that point the blood supply is close to the surface and so it cools down rapidly. I also wear fingerless gloves and that has reduced the heat loss considerably in my hands and fingers. The gloves don't interfere with my handling of the early morning paper work for deliveries at work and the fingers are free to operate and write down easily what is needed. Glad that the wood is selling well MR, all that hard work and in the cold! Although we had some overnight snow there is less this morning than yesterday, although I think it is cold. I don't get numb fingers as much as I used to do Gregotyn, and do sometimes wear fingerless gloves or wrist warmers, and yes, I think they do help. Perhaps I should try them when filling log nets, but I don't really want the ones I have to get too dirty or damaged. Perhaps I should knit some more with odd bits of sock wool. Glad all is well with you, but be careful you don't get too cold. Perhaps this summer you should see about getting one of your fires in a fit state to use so at least you have some heat at home next winter. Yesterday's high temperature was 14 degrees Fahrenheit. The night before it was down to minus 6.5 F. We may warm up to reach the freezing point today. Maybe. Some images to entertain you. 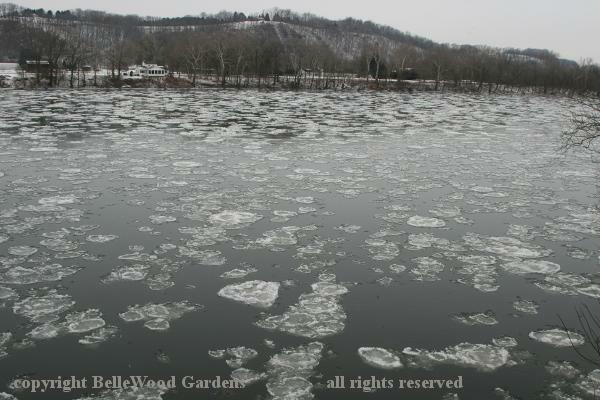 Ice on the Delaware River. 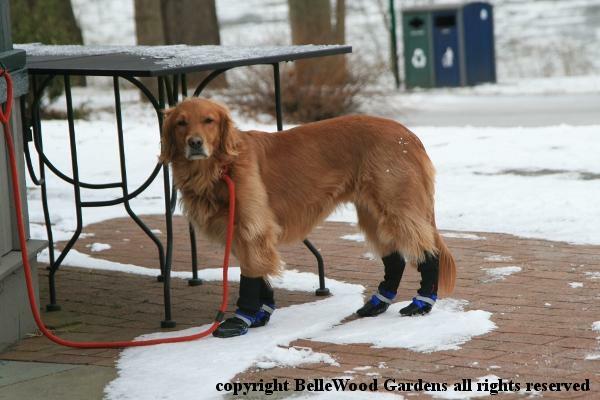 A dog, dressed for the weather. nice boots my mutt is rather envious. i am fairly convinced he would not be keen at having to wear them. just after the gfa there was a peace dividend of gov surplus stuff, i regret not getting a lifetime supply of dog boots at 50 pence a set. they even came in assorted sizes from savage beast to happy sniffer.